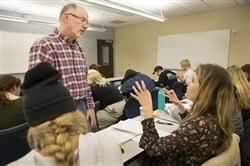 Professor in the Mathematics and Computer Science Department Dr. Glenn Acree was recently featured in the Nashville Ledger March 1 issue. The story features examples of how Nashville is becoming an up-and-coming tech city with Amazon’s impending arrival and other tech-enabled companies calling Nashville home, as well as tech education in Music City. He also shared that although automotive, music and health care may not be the typical tech shops, they are definitely dependent and driven by technology. He concluded by sharing there is an opportunity, and even perhaps an obligation, in this region for academic and industry technology to work together.